Store your clothing and accessories in contemporary style. Finished in a warm gray vintage color with a faint pearl effect will create an inviting atmosphere that you'll love to retreat in after a long day. 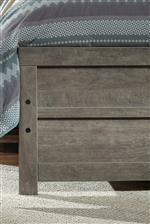 This piece provides ample storage space with five fully finished drawers. The Culverbach Contemporary Dresser Chest with 5 Drawers by Signature Design by Ashley at Casa Leaders Inc. in the Wilmington, Long Beach, Torrance, Lakewood, Los Angeles area. Product availability may vary. Contact us for the most current availability on this product.